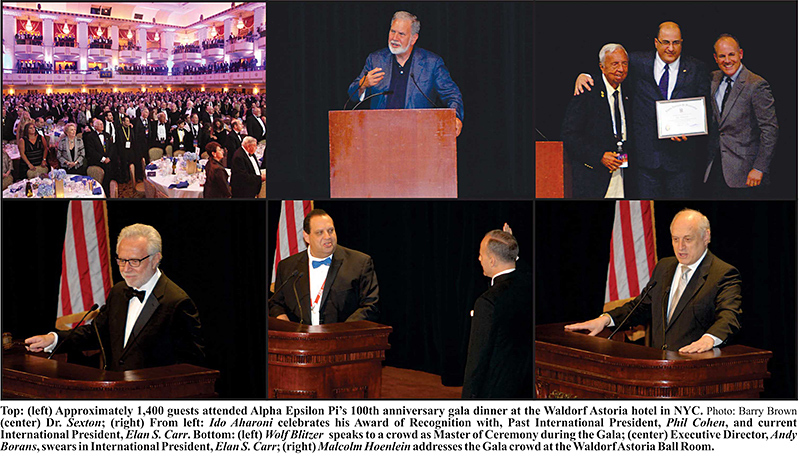 Approximately 1,400 members and guests from around the world, including over 600 students, came to the Waldorf-Astoria hotel for the Centennial celebrations and 100th anniversary convention of Alpha Epsilon Pi (AEPi). The historic series of events opened on Thursday, August 8, at New York University, the site of the Fraternity’s founding in 1913. Dr. John Sexton, president of NYU, and Ambassador Ido Aharoni, Consul General of Israel in New York and honorary AEPi brother, addressed a capacity audience at the campus’ Skirball Auditorium. The evening ended with a dinner cruise around lower Manhattan and the Statue of Liberty. In the past academic year alone, the students of AEPi around the world raised and donated $700,000 to charity, in addition to the money raised for its official philanthropies. That same afternoon and evening, AEPi rented the entire USS Intrepid Aircraft carrier. During the moving Shabbat dinner program on the ship’s deck and pier the Fraternity honored its Brothers who have served in the US Armed Forces and the IDF. State of Ohio Treasurer and past AEPi chapter president Josh Mandel, who twice deployed to Iraq as a US Marine, was the evening’s keynote speaker. Mr. Mandel was introduced by Maj. Gen. (ret.) Larry Taylor of the Marine Corps, an AEPi alumnus. An award for military service was presented to Capt. Jason Rubin, a Marine fighter pilot and former AEPi chapter president, who founded the support organization, Jews in Green. AEPi’s international president, Elan S. Carr, a currently serving reserve Army officer and a veteran of the Iraq war, addressed the audience as well. The event was lead by former Army chaplain Rabbi Stanley Davids, past international president of AEPi and past president of the Association of Reform Zionists of America (ARZA). Prior to the Shabbat event on the Intrepid, the students and alumni of AEPi, in partnership with Operation Gratitude, worked together to assemble 3,000 care packages for deployed troops. Founder and president of Operation Gratitude, Carolyn Blashek, was on hand to thank the brothers of AEPi for breaking records by assembling thousands of care kits in well under an hour. Leaders of AEPi partner agencies, including AIPAC, JNF, Hillel and B’nai B’rith attended AEPi’s “Partner’s Lunch” on Saturday, August 10, and spoke about AEPi’s central role in Jewish leadership. Las Vegas Sands Corp. President and COO Mike Leven, a past AEPi chapter president, opened the luncheon with a moving speech in which he said that AEPi is the best insurance policy for the survival of the Jewish people. The three-day celebration culminated with the Centennial Gala on Saturday night, August 10, hosted by CNN Anchor and AEPi alumnus, Wolf Blitzer who served as the evening’s Master of Ceremonies. A capacity audience of 1,400 members and guests filled the Waldorf’s grand ballroom. Elan S. Carr, of New York and Los Angeles, was installed as the Fraternity’s 71st International President. Seth “Yossi” Siegel, was presented with the Fraternity’s highest award for alumni achievement. Vector Group CEO Howard Lorber, also an alumnus, was recognized for contributions to the Jewish Programming Department, which bears his name. Malcolm Hoenlein, Executive Vice Chairman of the Conference of Presidents of Major American Jewish Organizations was initiated as a Brother earlier that week and spoke about Israel’s enduring strength in the face of adversity. Alpha Epsilon Pi (AEPi) is the international Jewish Brotherhood. AEPi exists to provide Jewish men with intense and transformative friendships, within a structure that teaches leadership, promotes service to country and community, and inculcates an enduring commitment to the Jewish people and the State of Israel. With alumni lodges in 22 cities and undergraduate chapters or colonies on 177 campuses throughout the United States, Canada, the United Kingdom, France, and Israel, the Fraternity is a major force for Jewish identity and Israel advocacy throughout the world. Founded at New York University in 1913, the Fraternity has initiated nearly 100,000 Brothers over the course of its 100 years of existence. Currently, AEPi is comprised of approximately 80,000 alumni members and 9,000 student members.